DISTINGUISH YOURSELF by displaying The College membership on your letterhead, your business cards, on your web site, and in professional notices in public media. QUALIFY FOR DISCOUNTS when attending live or video programs of TexasBarCLE, the State Bar’s award-winning CLE department. 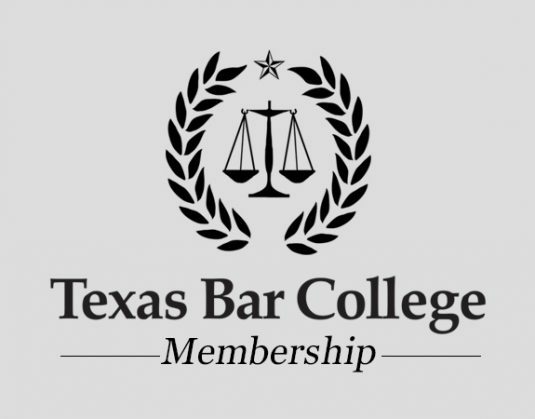 GET A FREE ANNUAL SUBSCRIPTION TO THE ONLINE LIBRARY, a service of www.TexasBarCLE.com, which provides searchable, 24-7 access to TexasBarCLE course materials from 1998 to date. ATTORNEYS ARE PERMITTED TO SET UP AND PRESENT “Flash CLE” programs in your community sponsored by The College. These are anytime, anywhere video replays of TexasBarCLE advanced courses and topical programs, with full written materials, at a special College member price. For more info, contact Jerry Phillips at 800-204-2222, Ext. 6820 or jphillips@texasbar.com. PARALEGALS ARE PERMITTED TO SET UP AND PRESENT “FLASH CLE” programs in your community sponsored by The College. These are anytime, anywhere video replays of TexasBarCLE advanced courses and topical programs, with full written materials, at a 37% discount from the retail price. Awards grants to local bar associations needing financial help in presenting CLE programs. Publishes a newsletter with information about activities and benefits three times each year. Provides this web site, TexasBarCollege.com, with complete information about The College and its programs. Presents new members a distinctive certificate suitable for framing and a portfolio with The College logo. Sells merchandise displaying The College logo. For your initial membership year, you must have accumulated at least 80 hours of accredited CLE within a three calendar-year period, or at least 45 hours in the current calendar year. At least three hours must be approved for legal ethics or professional responsibility credit. Up to 18 hours of the 80-hour requirement, or 6 hours of the 45-hour requirement, may be met by claiming self-study, rather than by going to classes. Membership is established and maintained on a calendar year basis. Subsequent years of membership require at least 30 hours of CLE, at least three of which must be in legal ethics or professional responsibility. The membership fee is $60. Newly licensed attorneys can join for a reduced rate of $35 upon completion of 45 hours within the first two calendar years of licensure. A paralegal may become, or may maintain his or her status as an associate member of the College by (1) completing twelve (12) hours of accredited CLE in the current calendar year which must include two (2) hours of ethics, (2) paying the required fee, (3) submitting an application form (click here to download) on which a licensed Texas attorney verifies the applicant\’s good character and qualifications as a paralegal, and (4) submitting a report identifying the sponsor of the CLE programs attended, the specific topics included, the names and firms of speakers on the programs. Accredited CLE may include up to 3 hours teaching credit (with no carryover hours) and 2 hours of self-study (1 hour can be ethics). An Associate Member may carryover up to 6 hours of accredited CLE to the next calendar year. Membership: Membership is established and maintained on a calendar year basis. Subsequent years of membership require at least 12 hours of CLE, at least two of which must be in legal ethics or professional responsibility. Fees: The fee for initial and maintaining members is $35.00.